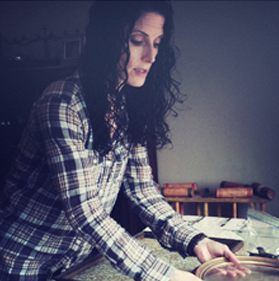 Laura’s passion for antiquing and design is infused into each of her creations. She spends time carefully exploring local antique stores, flea markets and garage sales, and she is inspired by her amazing finds to create her unique handcrafted pieces. Laura loves the challenge of taking items others have discarded, breathing new life into them and creating one-of-a-kind accessories, which are both personal and for the home. Dstressed began as a furniture painting company, mainly as a hobby and a favor to friends. That hobby evolved into a business as Laura searched for and collected numerous vintage furniture items of her own and, simultaneously, received calls from people wanting to upcycle their tired pieces. She is thrilled by the prospect of working with a client to completely transform a vintage piece of furniture while keeping the history alive and their memories intact. Although this is still a vibrant part of the business, Dstressed’s signature pieces are now custom and one-of-a-kind ottoman, serving and vanity trays upcycled from vintage frames and hardware, complimented with vintage-inspired fabrics. Laura carefully handcrafts each piece in her Skokie studio, with detailed attention to achieving the perfect balance of classic vintage and upscale chic. Laura has recently expanded her company to include handcrafted one of a kind upcycled leather cuffs, fashioned from vintage findings, including belt and shoe buckles and unique pins. The perfect pairing of classic vintage items with edgy leather results in a truly unique combination of ageless chic. In all aspects of her business, Laura strives to give each classic vintage piece an infusion of upscale chic, resulting in one-of-a- kind timeless creations.